Born in the San Francisco Bay Area. I was an artist since I can remember. I have been drawing every single day of my life sine I was four years old. In fact, my entire family was very artistic. My father drew a lot as a young man and was involved in photography. My mother was a Tahitian Dancer, and she was also extremely good with crafts. My siblings also loved to draw, and we would routinely draw together. My brother and I where basically the poorest kids in our neighborhood. Not to say that we lived in poverty, but we certainly had a lot of hard times growing up. It was a release to make fun of those things growing up. I always enjoyed art though, beyond making funny pictures, it has always been how I saw myself. When I first started learning how to tattoo, I was very excited, I really liked being called an apprentice. It had an old ring to it like I was the student of some long lost secret culture of artists. Today, people just expect to be given a chance simply because they’ve asked for it. That’s not how tattooing works, or at least not how it used to. I remember being taught how to make needles, and the owner of the shop explaining to me that it was a secret. That this thing that he was teaching me was what the “scratchers” at home tattooing in their garages wanted to know and how I was not to share this precious secret. I remember being showed how to tune machines, I remember seeing these carefully chosen companies to buy product from, machines, pigments. Being told that these where the real companies, the rest where crap. I remember that you had to be told these things, we even made some pigment at one point, although that is mostly a lost art, it used to be an important part of tattooing. I have tattoos on me from ink that we made, needles that we made, machines that we tuned. But this whole secret isn’t being passed down carefully any more. So many artists just give it away to less than deserving individuals. I remember learning to hand paint flash designs because it most resembled tattooing, not just in it’s appearance, but in the process; dipping your nib into the ink, carefully laying down a line, being very fearful of failing during the process. In both mediums you only really get one shot. That’s what I miss, that tattooing used to have a lot of magic to it. I started tattooing in 2001. I started my career at Tahiti Felix’s Master Tattoo in San Diego. The shop was originally established in 1949. During this time my interest really developed in large scale tattooing. The shop however was a traditional American tattoo shop, where I learned to tattoo on sailors, marines and learned the ropes of tattooing along side old timers Such as Maurice and Hiro Lynch. Over the years, I have worked in many of the world recognized tattoo shops such as Avalon Tattoo II in San Diego, Memoir Tattoo in Los Angels and Dare Devil Tattoo in NYC. During the Last 13 years, I have focused most of my career on illustrative tattooing. My interest in large scale custom tattooing has taken me across the country and made me an internationally recognized tattoo artist. I have been published in Many of the industries top Tattoo Publications such as International Tattoo, Tattoo Artist Magazine, Tattoo, Flash, Savage, Inked, Tattoo Planet, Tattoo Life, Tattoo Energy and Total Tattoo. 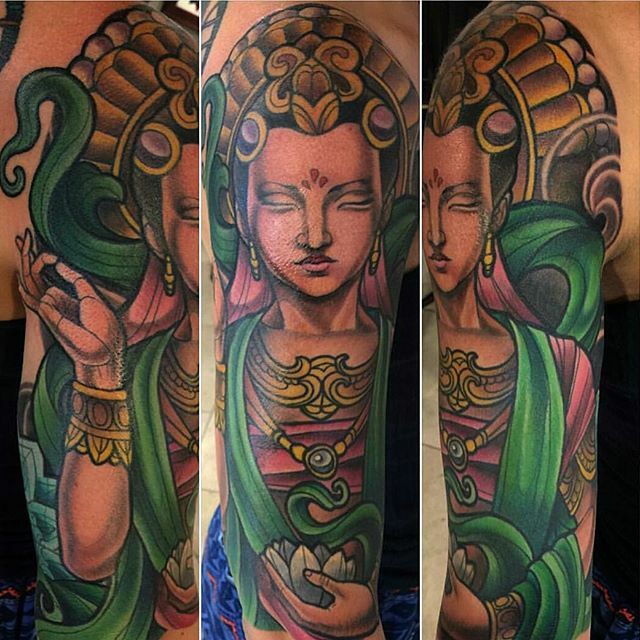 My interest in Art Nouveau, Illustratitive Tattoo work, Biomechanical, Japanese and Asian tattooing has allowed me to grow as an artist and become one of San Diego’s Best Tattoo artist. My distinct and instantly recognizable style has been a culmination of many years of hard work and study. Today, I spend much of my free time Painting in Oil and showing my work in Various Galleries across the country. I’ve been tattooing for over a decade at some of the best San Diego tattoo shops. I’ve been very lucky to have worked with amazing artists who really became family. It was hard and a little scary finally deciding to open my own shop, however it’s always been a dream to someday reach this point in my career. Now that we’re open, I’m thankful, and happy. We opened our doors in North Park, July 2011. We fixed up the building, and I love the atmosphere of the neighborhood. The people in the area are into art and music, there are a lot of tattooed people, bicyclists and culture. There’s a lot of charm here. Many of the people who have come into our shop really look through our portfolios and often say thank you after coming in—which is really rare in tattooing! We are a small shop but we are passionate about tattooing, and its all about the quality. I would like to keep it that way.